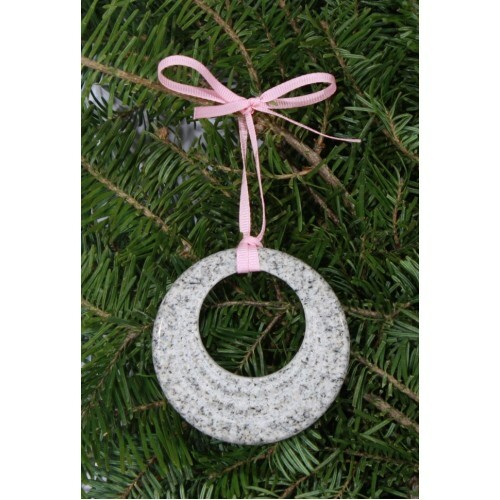 This hand crafted ornament is made from Fine New Hampshire Granite, poslished, carved by hand. It was created to share the message of hope, courage and optimism. I love this design of circles which are unending. Each ornament is approximately 2.5 inches in diameter. You have a choice of three ribbon colors, burgundy, silver-blue, or pink. 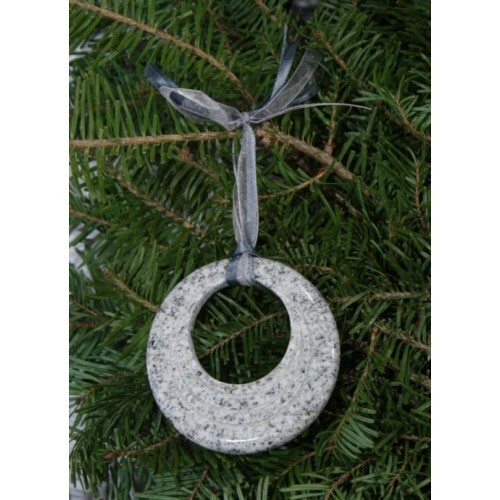 These are crafted in the USA by Sunapee Graniteworks. Here is the beautiful story behind the creation of these beautiful ornaments. Bill Stocker upon receiving the news of his wife’s diagnosis of breast cancer in the summer of 2011, began sculpting. While his wife Pamela battled her illness, Bill turned to his art and hands to express his concern and angst for her and others who battle disease. Along the way, Bill found that he was no longer feeling the suffering - indeed, Bill was on a new mission and that was to send a message of Hope, Optimism and Courage to people near and far. And so he sculpted the "Sunapee Rays of Hope", an 18,000 lb monolith with 103 vertical and horizontal rays. It stands sentry over the Sunapee Graniteworks yard - a life-affirming work of art created by a true artist. 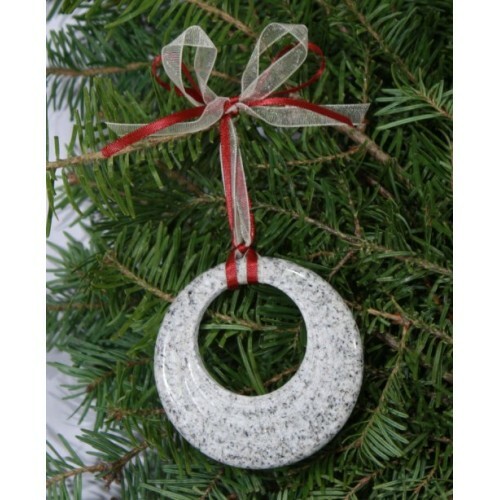 Pamela had her surgery in October and was home recuperating in December when she said to her husband and sons that she thought it would be a good idea to make an ornament from granite. With her battle so fresh on everyone's mind and the Sunapee Rays of Hope in the Granite yard, they crafted Bill's design, "Sunapee Circles of Hope" ornament.